. LAST BUT NOT LEAST - BEN AFFLECK/ BATMAN WOW WOW WOW ...Val Kilmer and George Clooney are breathing a collective sigh of relief after seeing this pile of steroid garbage take on the role of Batman. Yes after 2 long decades the monkey has been removed off of their backs...The worst possible Batman performance in history award can now be owned solely by Mr. Ben Affleck...Did anyone ever doubt him??? Jesse Eisenberg/ Lex Luthor - Wins the award for all time best over-acting a comic book villain since Willem Dafoe played the Green Goblin. After this heinous acting performance by Eisenberg, I am beginning to think Heath Ledger raised the bar too high for this new generation of Hollywood soft, pretentious pretty boy actors. Jeremy Irons/ Alfred the butler - Holy cow man! This guy has been mailing it in for the better part of 2 decades (since Die Hard with a Vengeance). It seems the studio financiers felt the need to strengthen the budget here by slashing the Morgan Freeman and Michael Caine salaries allowing the 2 characters to morph into one, contemptible performance by a British actor with some real acting "chops"
Confusion - Early scenes will attempt to confuse the viewer (successfully) in order to tie together several gaping plot holes (unsuccessfully). The problem here is you can see these outcomes coming a mile away. The viewer is left feeling patronized and a lack of a decent script becomes evident, as a result. Zack (rhymes with HACK!) Snyder/ The Director - The slow motion scenes used in this movie are such a desperate contrivance. His signature trademark only lends to extending the run time of the movie (ad-nauseum) and slows the pacing down (or lack thereof) to a complete stand still at times. There's slo mo used during the funeral scene...'NUFF SAID! The opening sequence - Bat boy Bruce Wayne sees his parents killed at gunpoint....AGAIN! Why must we always have to be spoon-fed the origin of this character in every damn movie. The psychotic flashbacks from his past will likely be thrown in later on in the movie and can allude to the dark knights brooding demeanor just fine, thank you. amy Adams/ Lois Lane - Wow! what a terribly written part for this character...Clueless and painfully unaffected by everything going on around her... I speak for all true Superman fans when I say, Margot Kidder, eat your heart out baby! If not for BATMAN: THE KILLING JOKE, BATMAN: RETURN OF THE CAPED CRUSADERS, and the recent LEGO BATMAN MOVIE, this would be the BATMAN movie of the year. PLEASE, find a new Lois Lane!!! Ugh! A significantly better film in its "Ultimate Edition". Weird use of the IP. Not at all what one likely expected based on the title but if you go into expecting a bit of an art house drama it is very entertaining. Great high energy movie spectacle. Happy to revisit 3rd reboot of "original crew of charactors" from Gene Roddenberry imagination. 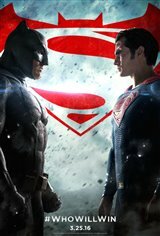 Was going to rate it 4 stars until that ridiculous battle between Superman and Batman where Superman wounds up being thrown around like a rag doll and looks very mortal. What happened to the man of steel who is supposedly faster than a speeding bullet , more powerful than a locomotive , and who earlier destroyed the batmobile? Also, why was it necessary near the end of the movie to have such a gigantic creature battling the super heroes ? Very disappointed how the movie ended. Otherwise , I liked the show and thought that Ben Affleck did well as Batman. It was ok. Not the best, still worth your money. Go watch it. The movie is very dark. The fighting scenes were very short. I am so glad I saw this movie at the cheap theatre. It had too many past life episodes, too many reflective periods. This movie could have been an hour shorter. "Why did you say Martha?" So bad. Superman can't get out of 10' of water with the staff, but he can pick it up and fly 1/4 of a mile with it in his hand. Worst movie I've seen in 5 years. When Batman shot him with the gas bombs, Superman, with his super speed could have easily got out of the way or used his breath to blow it away. So many more. So, basically, I didn't like Dawn Of Justice because as a comic book fan, it didn't relate to the comics. Also, BATMAN DON'T USE NO GUNS Y'ALL. Terrible. Very disconnected. The writing was bad, the editing was bad. I don't even know if the acting was bad because there wasn't much the actors could do with all the randomness. It was basically a set up for sequels. It would've been 5 stars if Jesse Eisenberg wasn't in it. Worst portrayal of Luthor and/or any villian in a superhero movie. Worst movie I have ever seen in theatres. I wanted to walk out, but my party wouldn't leave with me. Affleck.. Awesome, Gadot..Great, Cavill..Good, Eisenberg? What in the hell. Horrible. Worst casting ever. I fawking HATE jesse Eisenberg!! Astounding!! A visual feast for all movie goers. The plot was well developed as were the characters. This is my new favourite superhero movie. Full of quality and epic entertainment. 5 Stars. The acting was very good, the special effects were awesome & I guess the directing was OK, but the script was terrible. They could have made 2 movies out of this mess. This is the worst Batman Movie of all time, hard to follow and very disappointing. I should have played a 5 game pro line instead. Horrible movie in every way. Plot don't make sense, bad acting, just horrible please trust me. For example, (spoiler) after fuming the whole movie (2 hours worth), batman finally decides not to kill superman because (get this) their mothers have the same name..after that they are all buddy buddy. Just ridiculous. Batman is Awesome! Wonder Woman is Amazing! Superman is simply Incredible!! This movie is just Astounding!! Great action sequences, stupendous story, great build up, and the easter eggs of future DC movies are just Neverending!!! This movie is simply one of the very Best! loved this movie!!!!!!!! big Batman fan! I enjoyed the Ben Affleck as Batman. The iMax 3D was great. I would watch again. must see movie! Keeping in mind its an origin movie the pacing and material covered was done in the best possible way! Ben Affleck performance as Batman/Bruce Wayne ranks #1! Comicbook fans will be pleased with this movie! Action pack, and Ben did a good job as the bat! I loved every moment of this movie. From beginning to end I was constantly surprised by the casts performance. 2 thumbs up!! Based on a DC Comic Book, the plot is actually thought out and good. They did a great job with this story. Far better movie than what the critics would lead you to believe. Heavily inspired by various actual comic books (eg: The Dark Knight Returns by Frank Miller), and so most of the gripes seem to come from people who have never actually read such comics. Luthor was an odd take, but it's explained more than once that he's actually the son of the Lex Luthor we're all familiar with (a point that seems to be missed by everyone who hates him). Action was amazing, effects were amazing, Ben Affleck proved all the haters wrong with his portrayal of Batman, and contrary to what some of the commenters here are saying, there is a story, it just isn't spoon-fed to you the same way other action movies are. Very entraining. Love Ben Affleck as Batman. Just so you know I love comic book movies. I'm neither a DC or Marvel fan. I just want to see a good movie. The open scene is something we all know about Batman. It was put in there for one part at the end of the movie. "Martha" Wow their mothers share the same name. They can now be best buds. Wonder Woman, ok. They did steal from Xena the Warrior Princess for her costume. Did love her fight scenes. Oh, ya the whole movie is suppose to be about the epic battle, well that doesn't happen till the end of the movie. 2 hours of Ben brooding and Superman coming the rescue of Lois Lane, but when your boyfriend is Superman and is watching over you all the time who cares, but can't save his mother. Lex Luther is a cross between the Riddler & Joker. If you feel like this is one big commercial for the other movies, you are right. I did love Alfred! So bad , such a crap, don't like even to start analyzing it. My 11 old son noticed all the nonsense immediately and was laughing! Awesome movie. Ben Affleck surprised me, he was great as Bruce Wayne/Batman.